I have an early-to-mid-60s Drake TR-3 HF Radio. These are great radios, and a working specimen can be found for around $200 (as of early 2011), with a power supply for about $300. Unfortunately, if that power supply has the original electrolytic filter capacitors, it's only a matter of time before one of them fails. It might not be today, and it might not be next month, but sooner or later it's going to go, and if you're unlucky and lose the wrong one, it could cost you some moderately pricey tubes (like the three 12JB6 finals, for example!). I've been operating this station for some time now on the original AC-3 power supply with the capacitors it had in it when I purchased it. These capacitors aren't original (it has the words "filters Jan 1972" scratched on the bottom of the power supply chassis, and the values differ slightly from the Drake schematic), but they're not spring chickens, either. Since I recently came into possession of a second working AC-3 in much better physical condition, I'm taking the opportunity to re-cap and modernize the uglier of the two without taking my Drake station off the air. The photos in Fig. 1 give a good feel for the external condition of this AC-3 before cleanup and rebuild. It's definitely seen some better days, despite the fact that it does still work, and work well. Figure 1. Power supply before rebuild and cleanup. 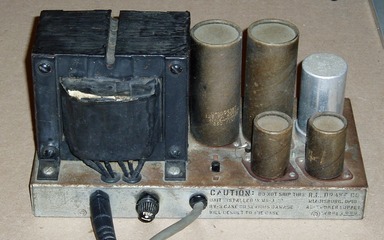 As the pictures show, there are four cardboard sleeve electrolytics and one aluminum can electrolytic standing on the top of the power supply, as well as the transformer. The transformer on this supply has some potting issues and hums more than I would like, but otherwise seems to be fine. The electrolytics are in only fair physical shape, but seem to work OK. As previously mentioned, they are not original, and the values are somewhat different from the original capacitors. The two tall cardboard cans are 125µF 400V, as they should be, and they are placed in series to filter the 650V HV supply. 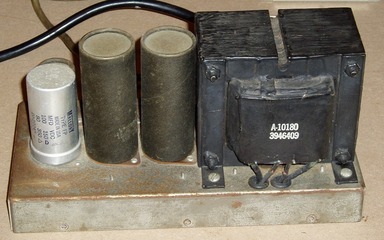 One of the two shorter cardboard sleeves is a dual capacitor, housing two 40µF 150V filters for the negative bias supply (in the neighborhood of -50V). These were originally 20µF capacitors, but were apparently changed out when the filters were replaced. The other short cardboard capacitor is a 100µF 150V device, forming one half of a series stack on the 250V HV supply. The aluminum can is another dual capacitor unit, this time housing a 100µF 150V capacitor (forming the other half of the stack previously mentioned) and a second 80µF 350V filter for the 250V supply. This supply puts out +650V for the finals, +250V for most other tubes in the radio (there is also a +150V OA2 regulator in the radio itself, driven by this 250V supply, for screens and the occasional plate), -50V for biasing, and a 12.6VAC unfiltered filament winding. Figure 2. Underside of the AC-3 chassis before rebuild, showing components. Fig. 2 shows the underside of the AC-3 chassis. Aside from the power cord, which I replaced last year some time and was not original to begin with, these components all appear to be original and are mostly in good shape. It is difficult to tell from this picture, but some of the potting tar from the aluminum can capacitor (bottom right in Fig. 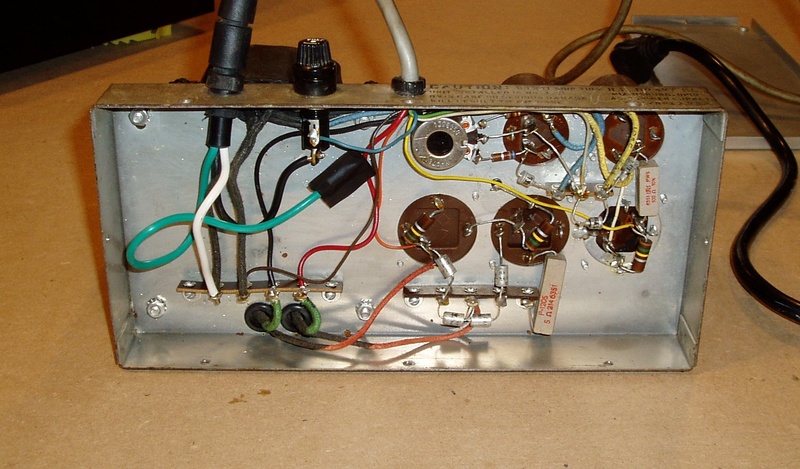 2) has extruded through the composite base of the capacitor. I don't know if this indicates imminent capacitor failure or not (examining the disassembled capacitor may provide more information), but it's not a good sign. Note the point-to-point wiring, barrier strips, and very large (by modern standards) components. 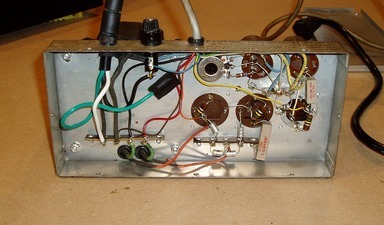 These features are all typical of construction of the era, and while the radio itself has more careful dressing, it looks substantially similar. Unfortunately, fifty-year-old barrier strips aren't the toughest thing around, and the four-spot strip pictured on the bottom right broke off between the first and second terminals on the right during removal. Other than that, the components all removed cleanly with a minimum of elbow grease.